(1) Low pH–A low pH cleanser is crucial to keeping bacteria at bay and is especially important for those with acne-prone skin. Many cleansers (especially those for oily skin) have too high of a pH (the feeling of squeaky clean skin may be enticing but you pay for it afterwards because the skin then overproduces oil to compensate for the amount washed away in the cleansing process). (2) Foam–Foaming cleansers are generally prescribed for oil and combination skin and they’re abundant in the marketplace. The problem with most low pH cleansers on the market is they don’t foam. And the ones that do foam are often high pH formulas. However, a cleanser that has both low pH and foaming action is a rarity and considered a unicorn in the skincare world. 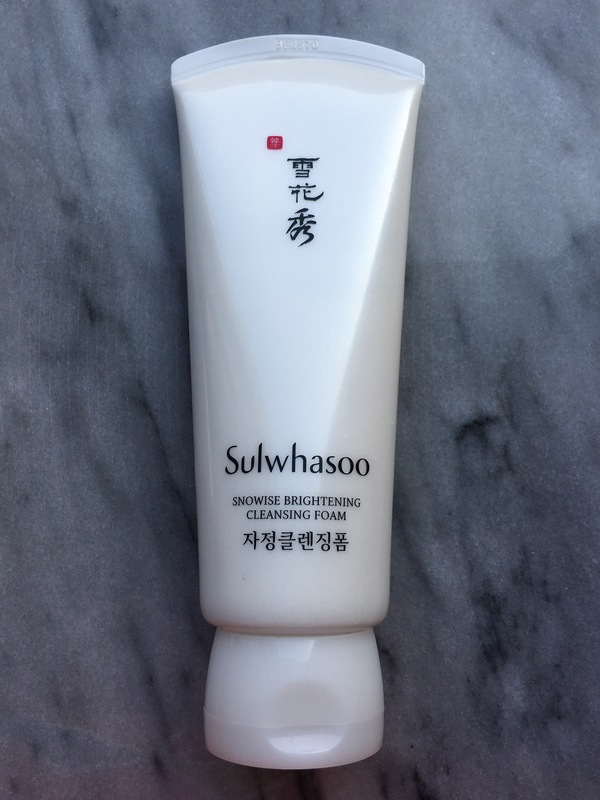 (3) Ginseng–As with most products in Sulwhasoo’s line, this cleanser has a medicinal scent due to its Chinese herb ingredient list with ginseng being the start ingredient. Ginseng can brighten and even out skin tone, among other things. When I use this in the shower at night, I leave it on my face for at least five minutes before washing it off. Although my freckles remain the same, the rest of my face is visually brighter. The product cleanses thoroughly without drying out my skin and is suitable for most skin types. 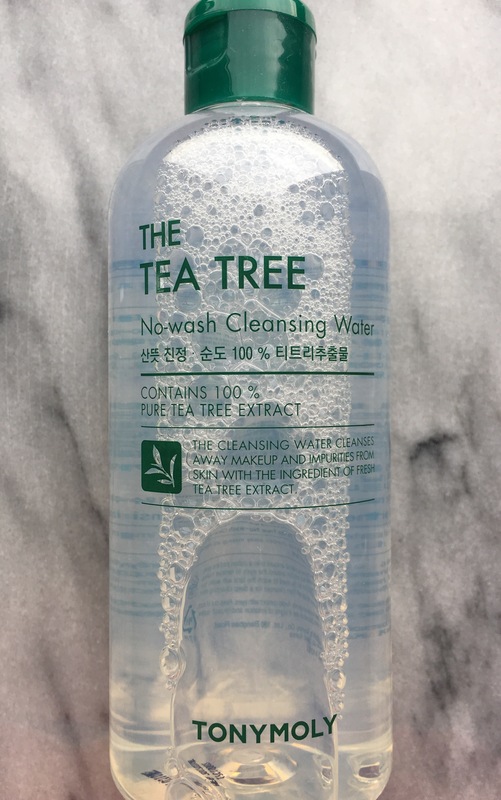 The last time I checked (about three months ago), this cleanser was unavailable in the US via department stores such as Nordstrom, Neiman’s, and Saks (even though the stores all carry the Sulwhasoo line). Amazon and eBay sell it but a good rule of thumb is to avoid such sites for skincare due to numerous incidents of counterfeit and expired products. For those in the US who wish to purchase this product, my advise would be to lobby the Sulwhasoo counter at your local department store, make a phone call to a major Korean department store and attempt to order it and have it shipped to you, or stock up (or get a friend to) on your next visit to Asia (as far as I know, this cleanser is widely available at all Sulwhasoo counters in department stores across Asia). Many of us are familiar with the benefits and convenience of using micellar water, especially for those who live in areas with hard tap water. Now, a version with tea tree oil! Although I still like to use a traditional foaming cleanser to wash my face in the morning and at night, I use this as a mid-day refresher (I only wear makeup on special occasions now so a few quick sweeps of this no-wash cleanser with a cotton pad does the trick). The result is soft, clean, and refreshed skin that smells faintly of tea tree oil. (1) AmorePacific Treatment Foam Cleanser–With a combination of vitamin C, lactose, and fruit extracts, this cleanser buffs away fine lines and dead skin cells. Good for normal to dry skin. (2) AmorePacific Treatment Enzyme Peel–Hands down, this is the best exfoliator I have ever used in my life. Ingredients include lactose and various plant and fruit extracts. The beauty of this product is that not only does it exfoliate well, it is also extremely gentle as it is a powder (turn to foam with water) formula. Great for all skin types. Since I have acne-prone skin, the cleanser (although an excellent one) doesn’t make it to my permanent skincare line-up. Perhaps it’s the acidity (which would make it more suitable for those with normal to dry skin). The exfoliator (or peel) is definitely a keeper. (1) SK-II Treatment Cleanser–This is truly an anti-aging cleanser (no ifs, ands, or buts). The Pitera (SK-II’s power ingredient) immediately firms and treats fine lines. The slight tingling reaffirms this. Great for those with normal or dry skin. (2) SK-II Facial Treatment Clear Lotion–Great toner for most skin types. The Pitera (in all SK-II products) treats fine lines and spots while the lactic acid exfoliates and sloughs off dead skin cells. Of the entire line, this is my favorite. (3) SK-II Cellumination Mask-In Lotion–This can be used as a toner and/or a mask (by itself or via a cloth sheet mask). SK-II Cellumination products are designed to brighten skin tone and diminish spots. The product definitely brightened my skin tone after a few uses but didn’t appear to have any other benefits. Best for those with normal or dry skin. (4) SK-II Facial Treatment Essence–This serum is what put the brand on the map. With the most concentration of Pitera of all SK-II products, the serum attacks lines, wrinkles, and uneven skin tone with just a few swipes of a cotton ball. Wonderful for those with normal or dry skin. (5) SK-II Essential Power Eye Cream–If your skin is normal or dry and you can only buy one eye cream, this is it. Armed with Pitera, this cream firms, tightens, treats, and moisturizes–it’s an all-in-one. All in all, SK-II is a fantastic anti-aging line and is best for those with normal to dry skin. Unfortunately, I have oily skin during the spring and summer months and combination skin during the fall and winter months. If you’re acne-prone like I am, the Pitera (and perhaps all the acidity in the line) will likely exacerbate pimples and blackheads.